Bullace Mews is a charming gated development of five individual homes carefully carved from one of Dartford’s most historical buildings dating back to the 14th century. Each property has its own individual character and personality offering ultra-contemporary accommodation coupled with quirky and intriguing spaces along with original features including exposed beams. Each property offers a fitted kitchen with integrated appliances, stylish bathroom/shower room, floorings, double/secondary glazing and electric radiators. These statement homes are located in the heart of the town centre with shopping facilities, amenities and mainline railway station all on the doorstep. 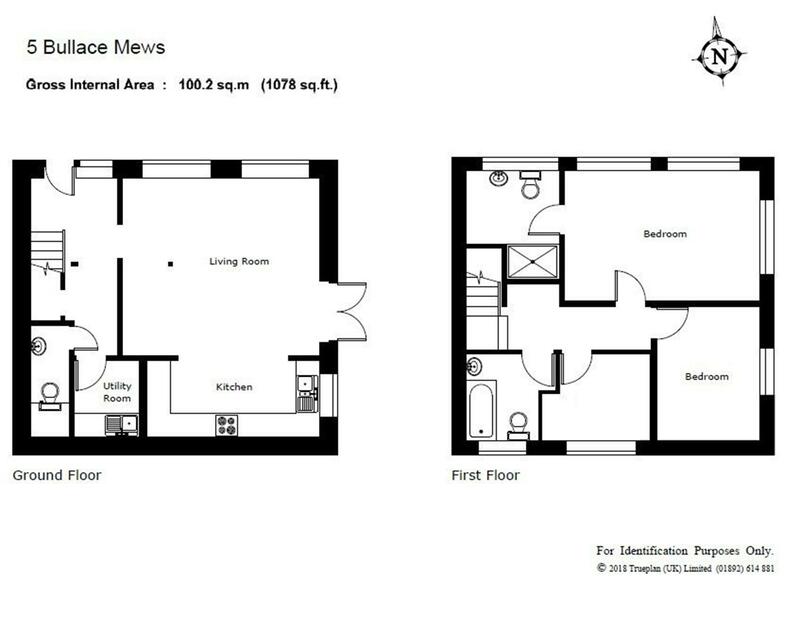 Plot 5 is an (1,078 sq ft) end of terrace mews house in a gated development comprising: living room/kitchen, utility room, two bedrooms, study/third bedroom and bathroom whilst externally there is a garden and two allocated parking spaces. Dartford is the principal town in the borough of Dartford and is home to Dartford F.C. It is situated in the northwest corner of Kent, 16 miles (26 km) east south-east of Central London. Dartford became a market town in medieval times and, although today it is principally a commuter town for Greater London, it has a long history of religious, industrial and cultural importance and has an important rail hub. The main through-road avoids the town itself and the town centre offers many facilities including Prospect Place Retail Park, the Orchard theatre, library, museum, central park, weekly markets and an array of local shops and public houses. Dartford has plenty of schools catering from reception to year 13 which includes four grammar schools at secondary level. The town centre is situated in a valley through which the River Darent flows, and where the old road from London to Dover crossed: hence the name, from Darent ford. Dartford also has a mainline railway station with regular services to London and road links from the area giving access to A2/M2, A20/M20, M25 and Dartford Tunnel as well as the Bluewater Shopping Complex and Ebbsfleet International station. This historically interesting building, formerly occupied by the Woolwich Building Society, is Dartford's only surviving example of a 14th century timber-framed town house. The front ground floor portion of the building - now a retail shop - contains the remnants of a building dating back to the 15th century. According to the local historian John Dunkin, one of the rooms on the first floor of this building was hung with a tapestry said to have been worked by the nuns of Dartford. Unfortunately, the tapestry became decayed and was taken down c.1817. A number of original features of interest have been left exposed and highlighted. Visitors to the shop can now see a three-light window from the 16th century above a section of flint rubble walling which supports the timber framework. Outside can be seen the jettled or overhanging upper floor which increases the floor area of the upper storeys. A blocked 16th century doorway can also be seen in Bullace Lane on the side of this building. The remaining part of the building has recently been sympathetically converted and renovated by the sellers to create Bullace Mews a residential development of two and three bedroom homes with allocated parking in a gated courtyard. The property can be found off the High Street in Bullace Lane via a gated entrance. Door to front. Double glazed window to front. Radiator. 6' 4" x 3' 2" (1.93m x 0.97m) Low level flush W.C. Sink. 6' 5" x 6' 4" (1.96m x 1.93m) Single drainer sink unit. Wall and base units with work tops over. Plumbed for washing machine. 16' 1" x 14' 2" (4.90m x 4.32m) Double glazed window to front. Double glazed French doors leading to garden. Two radiators. Carpet. 14' 3" x 6' 3" (4.34m x 1.91m) Double glazed window overlooking garden. Concealed lighting. One and a half bowl sink unit with single drainer. Range of contemporary wall and base units with co-ordinating work tops over. Built-in oven and hob with cooker hood over. Built-in dishwasher, fridge and separate freezer. 16' 4" x 10' 11" (4.98m x 3.33m) Double glazed window overlooking garden. Double glazed window to front. Two radiators. Carpet. 7' 6" (2.29m) x 6' (1.83m) to shower. Built-in shower cubicle. Low level flush W.C. Vanity sink unit. Racked radiator. 11' 1" x 8' 7" (3.38m x 2.62m) Double glazed window overlooking garden. Radiator. Carpet. 8' 1" x 7' 2" (2.46m x 2.18m) Double glazed window to side. Radiator. Carpet. 7' 2" x 7' (2.18m x 2.13m) Double glazed window to side. Panelled bath. Vanity sink unit. Low level flush W.C. Racked radiator. 30' x 23' (9.14m x 7.01m) Side access. Fenced and walled. Patio area. Steps leading to lawn area. Outside tap. The property is also within easy reach of Ebbsfleet Eurostar International Station. Information sourced from Rightmove (findaschool). Please check with the local authority as to catchment areas and intake criteria. We recognise that buying a property is a big commitment and therefore recommend that you visit the local authority website www.dartford.gov.uk and the following websites for more helpful information about the property and local area before proceeding. Some information in these details are taken from third party sources. Should any of the information be critical in you decision making then please contact Clifton & Co for verification. The vendor confirms to us that the property is freehold. Should you proceed with the purchase of this property your solicitor must verify these details. For information regarding Council Tax, contact Dartford Borough Council on 01322 343434. The mention of any appliances and/or services within these particulars does not imply that they are in full efficient working order. All measurements are approximate and therefore may be subject to a small margin of error. The property may be subject to a service charge for the development. Should you proceed with the purchase of the property your solicitor must verify these details. Viewing via Clifton & Co on 01322 628266. Property experts in North West Kent.